The last time I visited the Nighthawk Diner, I mentioned that Lacey and I were full up on Jaffles. What are Jaffles, you ask? Well, according to Jafe Jaffles owner, Luke, Jaffles (pronounced Jaffles as in Jam and not Yaffles as in Ja) are the most Australian sandwich ever. Jaffles are made in a Jaffle Iron, which is basically a kind of sandwich maker. In days of yore, Jaffle Irons were long-handled cast-iron medieval bread torturing devices, which were held over a fire. Modern Jaffle Irons are electric and about as dangerous, though they take slightly less time to cook things. The resulting sandwich produced by such a device is automatically crimped diagonally and toasted through so that the fillings have partially melted. Jaffle fillings are varied and insane in a manner that only an Australian sandwich can be. …and promptly gained ALL the pounds. Luke informed me that if I hadn’t yet eaten a spaghetti and cheese Jaffle, I hadn’t lived. 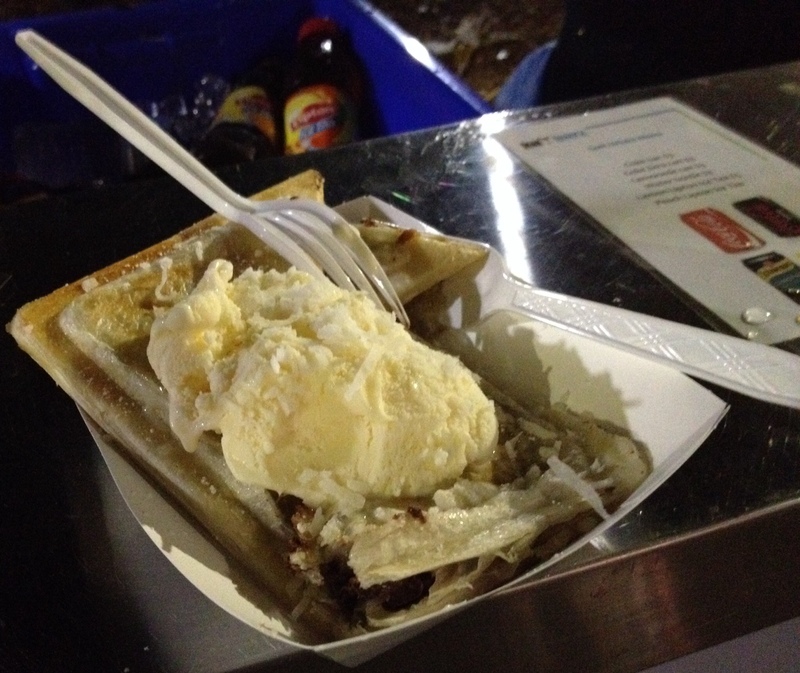 However, as I am a firm believer of desserts first in any setting, I purchased the Choc-a-doodle-doo Jaffle, which consisted of nutella and banana filling in a pastry shell and topped with vanilla ice cream and toasted coconut flakes. The Jaffle was quite nice. The toasted bananas really complemented nutella filling very well and the ice cream and coconut shavings helped to give the overall dish a semi-tropical flavour. The pastry shell was crunchy, but slightly squidgy towards the middle, particularly after the hot sandwich started melting and absorbing the ice cream. The dish was a little bit difficult to eat with the provided plastic forks, but I managed to scarf all of it down anyway. Overall, though, it was pretty tasty. 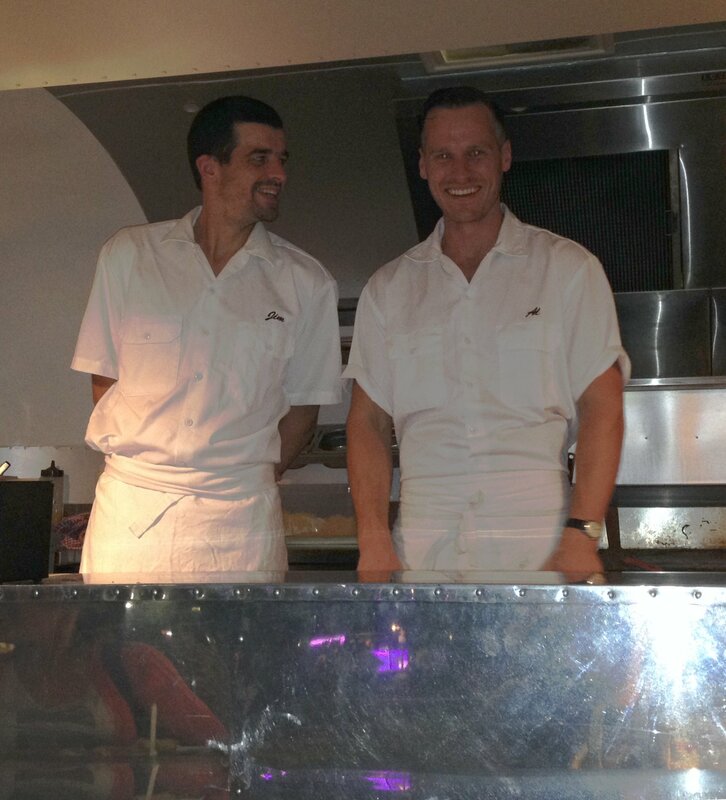 The energy from Jafe Jaffles staff and owners is truly contagious, bringing a new meaning to service with a smile. The sheer level of enthusiasm really made me very interested in the product, and I wasn’t disappointed. 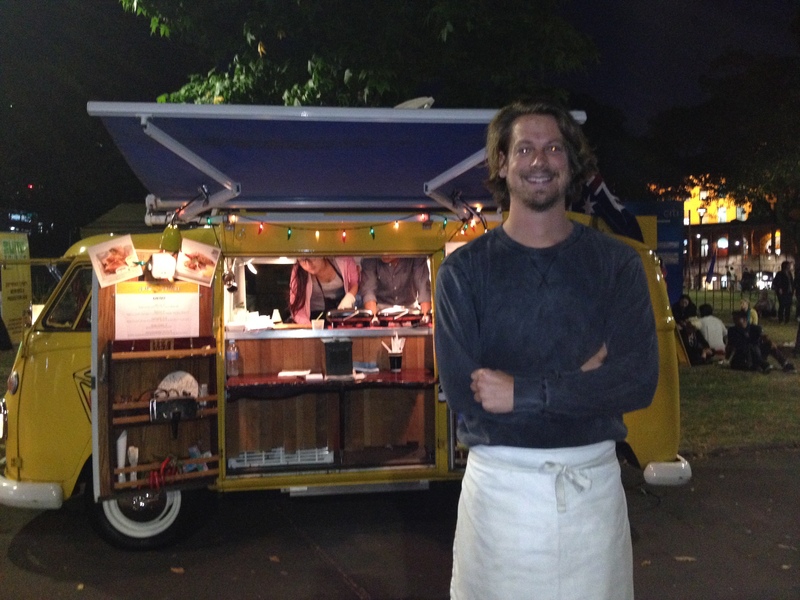 Jafe Jaffles will be at Food Trucks United at Belmore Park tonight (6th December 2013). I’ll be there as well, so do come along and enjoy feasting on the many delicious things they have on offer. I work in an out of the way place and while I do bring my own lunch box to work everyday, I do occasionally crave food that I’m unable to make at home. Thus, I’m very appreciative of the recent increase in the quality and quantity of mobile food trucks in the greater Sydney area. The Nighthawk Diner mobile dining car is a delicious example of just such a convenience, providing food to hungry office workers and tourists from Queen Latifah, a gorgeously refurbished 1959 International Harvester Scout. 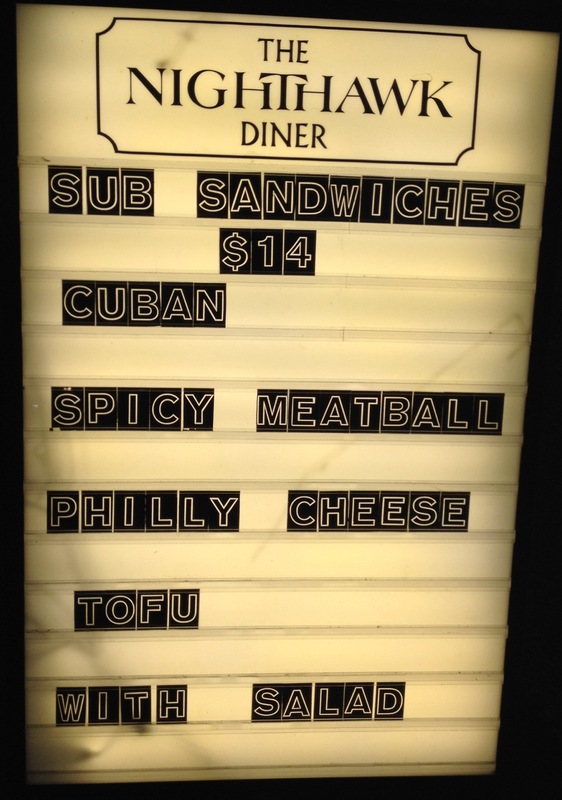 The diner is owned by Al and Jim, a pair of young chefs with experience in French-style fine dining. Sick of being faced with the same kitchens day in and day out with no contact with customers, Al and Jim decided to get a change of scenery and took to the roads in order to meet new people and serve basically whatever the heck they wanted to. And their food is absolutely delicious. 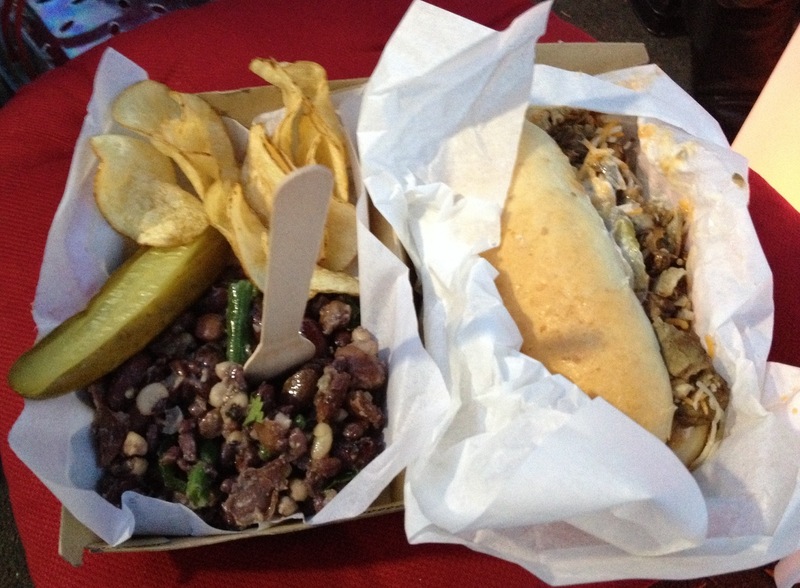 I chanced upon the Nighthawk Diner on the way home from work one evening and was ate a recommended Philly Cheese Steak sub meal, which came with a bean salad, potato crisps and a large green pickle. Al and Jim are fairly confident in their culinary skills, so every part of the meal from the pickle to the bun is made from scratch. I had the pleasure of watching them finely slice, then fry the potato crisps onsite before plating it up for me. The prices on Nighthawk Diner are a little steep for a regular food truck, but the size of the portions more than make up for the expense. They were generous enough for Lacey and I to share a single meal, though it must be said that we were both a little full from Jaffle eating at the time (more on this later). The food is served up at just the right temperature for immediate consumption. The summer bean salad was an absolute delight, with the subtle flavour of the French green beans infused into the rest of the salad and given just the right amount of zing through the addition of green chillies. The crisps were not over salty. And the Philly Cheese Steak was so good that despite being fairly replete after having eaten my share, it still took every little dollop of self-control I had not to push Lacey over and steal her half! The Nighthawk Diner tends to drive around all over Sydney, but you can find out where they’re stopping each day online. Alternatively, you can catch Al and Jim monthly at Food Trucks United. I’ve also been given to understand that they have a slightly more permanent arm at the Nighthawk Underground in Surry Hills. Me, I’m looking forward to seeing them again and maybe I’ll get one of their Vanilla and Maple milkshakes next time.